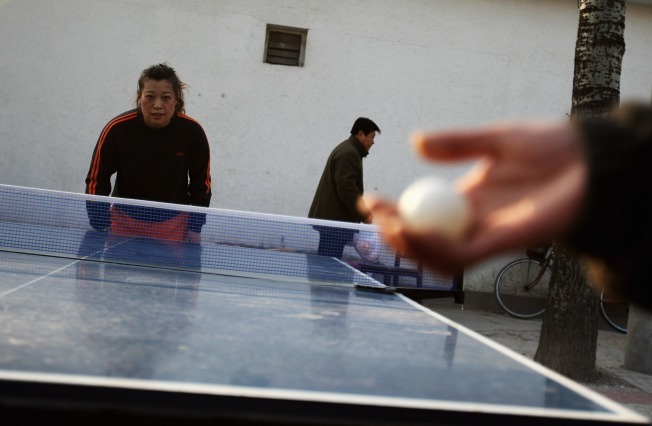 A ping pong pastime will cost ya. With cash-strapped New Yorkers cutting back on simple pleasures like dining out or short cab rides around town, someone, somewhere has left about $60 a month free for their monthly ping pong membership fee at Spin New York. You heard right ... for about $2 a day paddle-lovers can retain access to what has to be the city's most ultimate "ping pong social club." In membership information sent to DBTH, we learn that "The club offers unparalleled table tennis courts, including Olympic quality cushioned flooring, 16 individual tables, and a stadium-like center court." Further amenities include a ping pong pro shop, bar, hang out room and "over a dozen internationally known professional coaches and players," otherwise known as the cool kids. That $60 only applies for single memberships - Spin knocked it up to $90 a month for families or $900 a year. I'm sure this is all worth it to some, but I still can't even beat my dad on our basement table, which has to date outlasted a few rather raucous rounds of beer pong.